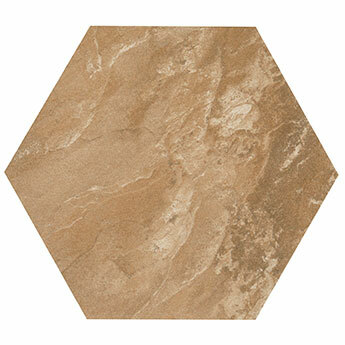 These stone inspired hexagon ceramic tiles are well suited to rustic interior designs. The beige colour is interspersed by lighter natural stone effect features which produce a distinctive character. This look has been emphasised further by a matt finish. You can use these tiles as part of backsplash features above worktops in kitchens. They also provide living room fireplaces with a unique charm. These high quality ceramic tiles are also selected for shops and offices as part of commercial renovations. In addition to the stylish appearance these tiles are also easy to clean and maintain. If you think these tiles would look perfect as part of your chosen design then it is quick and easy to order a sample from Tilesporcelain.